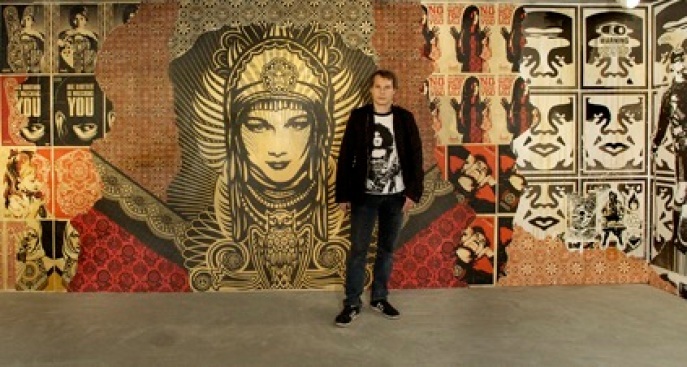 Shepard Fairey in Tokyo, Japan. Boston police arrestedShepard Fairey, the artist who has come to national prominence with his Obama Hope posters, on Friday before the opening of his show "Supply and Demand" at the Institute for Contemporary Art. The charge was a familiar one: Warrants for his arrest were issued in January after police determined Fairey, a Rhode Island School of Design alum, tagged two prominent locations in Boston. Before the Obama posters, Fairey was most well-known for his pseudo-propaganda street-art campaign revolving around the wrestler Andre the Giant — which carried the slogan "Andre the Giant has a Posse" —, an idea he started on a lark as an illustration student at RISD. His art has been the subject of intense bickering and Fairey's work has regularly come under snide attack from contemptuous armchair art critics. The caustic put-downs generally charge Fairey with being derivative or an outright rip-off artist. But they put him in good company — Warhol and Lichtenstein were the objects of similar derision. If the controversy surrounding Fairey became especially heated after he created the Obama posters in his typical propaganda-art style, it got searing when an AP photographer came forward demanding royalties because the iconic poster was based on his photo. When Studio One, Fairey's studio in Los Angeles, staged a multi-artist gallery show on M Street in Washington D.C. on inauguration week, at the same time the Hope poster was installed in the National Portrait Gallery, the tagging was more restrained than that in Boston. In D.C. tagging consisted of the occasional Andre the Giant sticker coyly and strategically placed on a street signs on M Street along the path the the gallery. Reps at Studio One claim Fairey had no idea there was a warrant for his arrest, but you have to think he must have. A "renegade" street artist can't buy this kind of publicity. And after signing on to do the "Want It" posters and bags for Saks Fifth Avenue, maybe he figured his image could use a little roughing up. This isn't the first time Fairey has been arrested. Guess some things don't change.